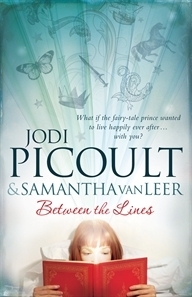 Between the Lines by Jodi Picoult and Samantha van Leer is a book that is all about “what if.” What if the characters of your favourite fairytale were alive inside the book? What if when you close the book they fall out of character and live life as they choose? What if the fairytale prince is desperate to get out of the book and stop performing the same part over and over again? And what if one day he finally makes himself heard by a reader – a teenage girl. Now she must figure out a way to break the prince out of the book. I have to say it’s an interesting premise. Samantha van Leer is the teenage daughter of bestselling author Jodi Picoult and this book was her idea. I’ve read a few Jodi Picoult books and this one was drastically different. So if you’re a fan of Jodi’s, don’t expect it to be anything like My Sister’s Keeper. The thing I really liked about this book were the illustrations throughout. There were illustrations of princes, dragons, mermaids and cute silhouettes of characters dangling from words on the page. Different coloured font was used when the story was being told from different characters point-of-view. There were three points-of-view: the reader Delilah, the prince Oliver and then you read pages out of the fairytale. I thought that was quite clever. This book was meant for a Young Adult audience. I think that girls in their younger teens, possibly even pre-teens, would love this book. For me, it didn’t have the depth of other YA novels – the kind that find a dedicated adult audience as well. I found it enjoyable. I appreciated the illustrations and the way the authors wanted to make this book an object of beauty in printed form. But it was a bit of a mixed bag for me. I liked it but can’t say I loved it. I’d be interested to hear other readers’ opinions. Yes, I love ‘Lost in Austen.’ I own it on DVD! LOL…I’m right there with you on Mr. Darcy 🙂 I tried reading My Sister’s Keeper…but it was just too tough for me to get through…maybe some day.. I love the sound of this book but I’m hesitant. The last book I read by Picoult I threw across the room. Not sure what to do about this one. Never mind Mr. Darcy! How about reading a 007 novel? Surely James Bond needs a holiday?